This celebration happens on the second Thursday after Epiphany (Three Kings Day). It is the second most popular party in Salvador, after Carnival. The washing of the Igreja do Bonfim (Church of Bonfim) steps is a tradition that mixes the faiths of the two main religions: Catholicism and the Candomblé. 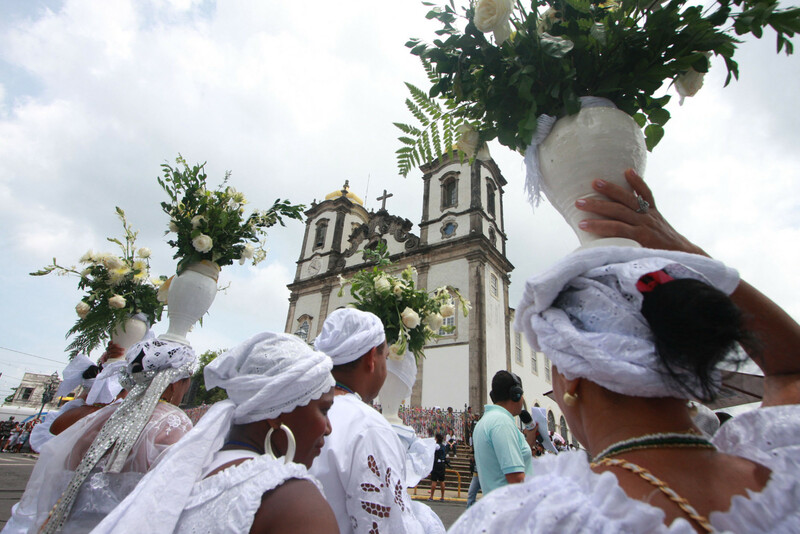 The mães de santos, female priests in the Candomblé religion, dress in ritual costumes and start the procession at the Conceição da Praia church by walking, dancing, singing religious songs, and carrying flowers up to the top of Bonfim Church. There, they wash the stairways of the church with scented water. Senhor do Bonfim became an object of popular devotion due to his powerful miracles. He is syncretized with the orixá Oxalá (Obatala). Thousands of believers accompany the procession in search of protection, to pay a hommage, purification of their soul, or simply to have fun. It’s a huge party with lots of batucada (drumming). A huge party starts around the Mercado Modelo earlier in the day and an even bigger party continues around the Church of Bonfim later in the day and into the night.